Activating responsive design is completely risk-free. You can always switch back and use your old mobile site again. For 90% of websites, responsive design is a much more effective way to manage the mobile experience and will save you a lot of time in maintaining your site but don’t take our word for it, try it for yourself and let us know how it goes! How do I make my existing site responsive? Be aware that there are two pre-requisites you need in order to create a responsive site: 1) Your site needs to have a D4 design skin. 2) You need to have the proper subscription(s) in place. If these prerequisites are fulfilled you just need to check the checkbox and click apply/save. Your site is now responsive! If you had an existing and separate mobile site that site will no longer be visible for your visitors. Instead they will see the responsive version of your site. You may switch back to displaying your old mobile site by de-activating the responsive feature (same place as where you activated it) at any time. Presenting your entire website (especially if it’s particularly complex) to mobile users is less than ideal so responsive design is not the whole story. With responsive design, you can still highly customize the mobile user experience by selecting which pages and which modules you’d like to show on desktops, mobile devices or both. This means you can limit the pages shown on mobile devices, add specific pages or even just particular modules to pages that are most helpful for mobile users (click-to-call buttons, maps, etc). This is the best of both worlds. You get amazing responsive design which will display your site beautifully no matter what the screen size, but you’ll also be able to fully tailor your site to mobile users on the go. 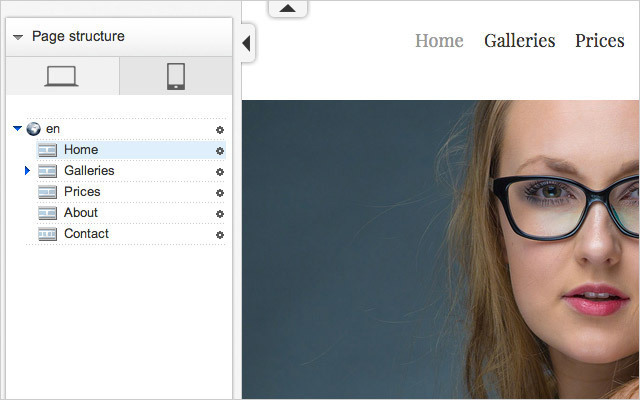 Once responsive design is activated, you’ll no longer see a ‘Mobile’ tab in the menu at the very top of the tool. Instead, in your ‘Website’ tab you’ll see a mobile and desktop icon at the top of the page structure area on the left-hand side of the editor view. Click these icons to switch between the desktop and mobile views of your site.